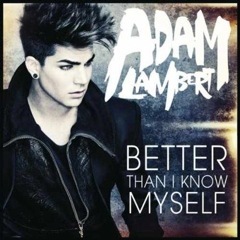 We recently posted a snippet of the new single from Adam Lambert, Better Than I Know Myself - just 30 seconds to whet your appetite - but now we've got the whole thing! This song is definitely a grower. You like it the first time you hear it but with each and every listen you like it more and more. This is becoming a trait of Adam's music with many saying 'meh' when What Do You Want From Me first came out, then it became one of the biggest hits of the year! With his new single Adam brings a real anthemic quality, powerful chorus with booming vocals and verses that keep you hooked and wanting to hear more. One of the most talented artists to come out of the States in recent years and an artist who stays true to himself we can't wait to watch Better Than I Know Myself rocket to the top of the charts & it's out now on iTunes.